One of the main advantages of the Internet is that it opens the world to interesting and educational information that anyone can access. One program that acts as a gateway to knowledge is NASA’s Eyes Visualization. It’s a neat application that allows you to explore information on the universe, NASA missions and planets. The application installs instantly and it sports a really intuitive and lightweight graphical interface with many tools at hand. It comes with two modes to choose from, the simple mode gives you a guided tour of destinations, missions, features and news. You can use the advanced mode for exploring information on your own. It comes with the option to explore three sections, one with data on the Earth, the second with information on your solar system and one that allows you to explore planets. You can explore the Earth’s vital signs and fly along using NASA satellites so you can view all sort of information and data on planet Earth. It displays the image of the day, current news and stories about the Planet Earth. The second section allows you to explore our solar system and the spacecraft that you’ll be using in order to travel inside the program. It features many modules, including Pluto, the Dawn Mission, Cassini’s Tour, Landee and the Moon. It shows you the global temperature on Earth using a map, you can view information on the Aqua mission and visualize the Solar System, using multiple controls and tools for adjusting the speed and rate. It gives you information on the number of planets in the Solar System, the stars with planets and earthlike planets. It doesn’t come with the option to export information on your computer. 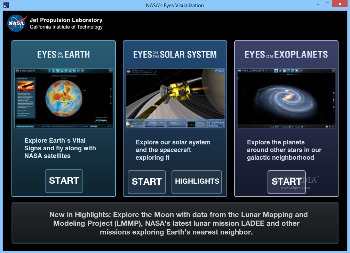 All in all, NASA’s Eyes Visualization is a very useful application for exploring the Earth, getting information about missions and planets in the Solar System.